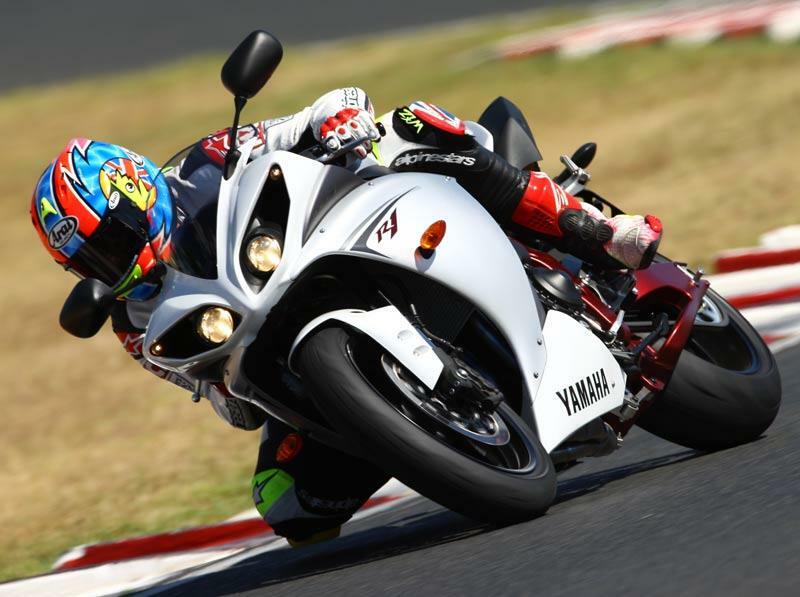 The 2009 Yamaha R1 is like no in-line-four cylinder sportsbike ever produced. It’s simply sensational. 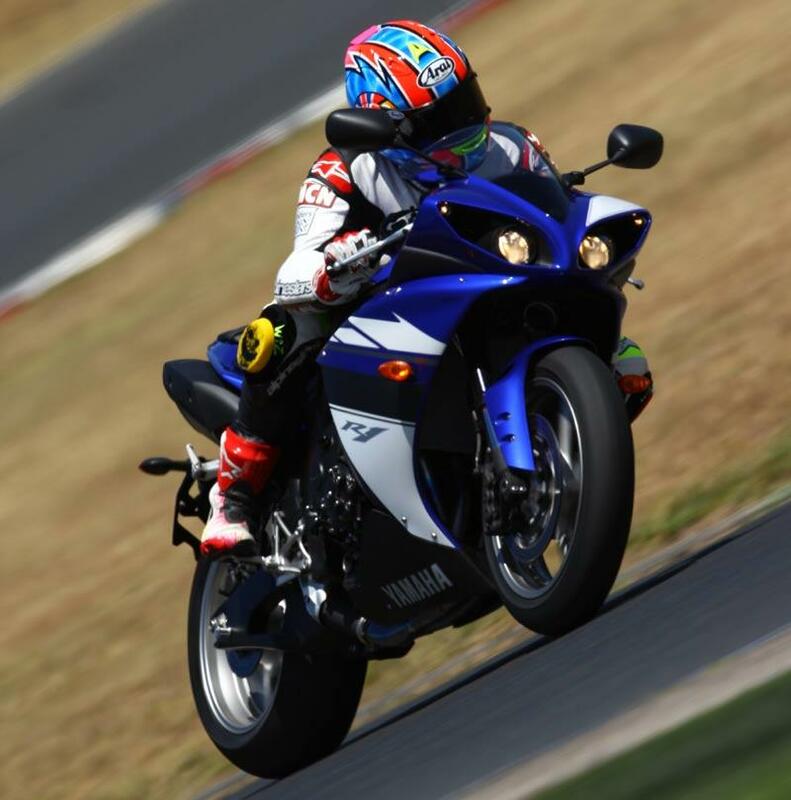 The Yamaha R1’s ultra-short-stroke engine has a cross-plane crankshaft, with its crank pins set at 90° and has irregular firing intervals, which is technology lifted directly from Valentino Rossi’s factory YZR-M1. 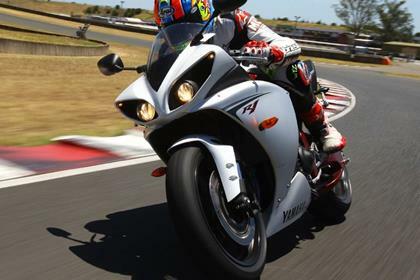 At a standstill the motor spins up like a two-stroke and on the move the R1’s ability to accelerate, no matter where you are in the revs is astonishing. Thanks to the clever engine design it grunts off corners like a V-twin, while giving superb feel through the rear tyre, and howls along straights like the mad, bad in-line-four it really is. Best of all it sounds just like Rossi’s M1 at full chat. 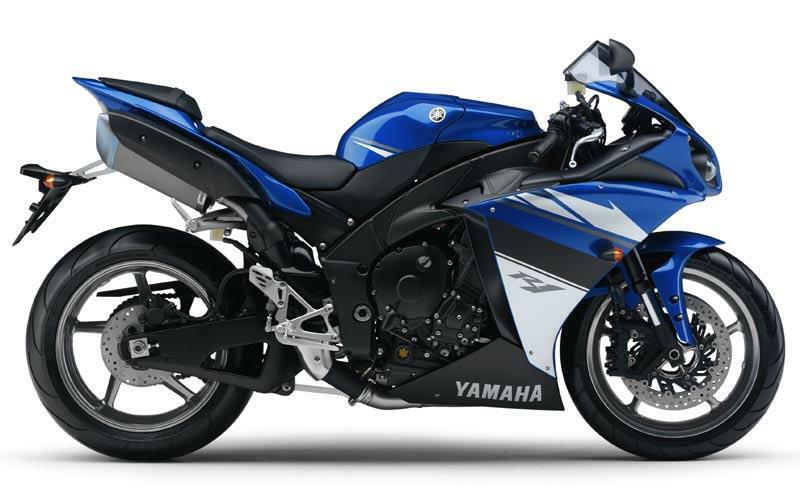 Compared to the previous Yamaha R1, the ’09 model is sharper steering but still retains the familiar Yamaha neutral feel. 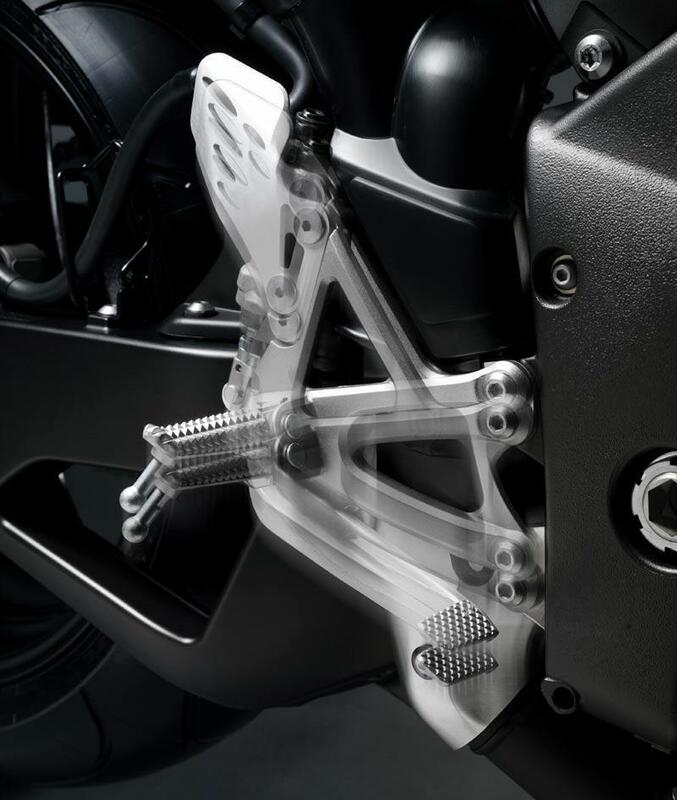 The R1’s twin-spar deltabox frame and swingarm, made up of die-cast and pressed sheets of aluminium has the balance and dimensions similar to the factory M1. 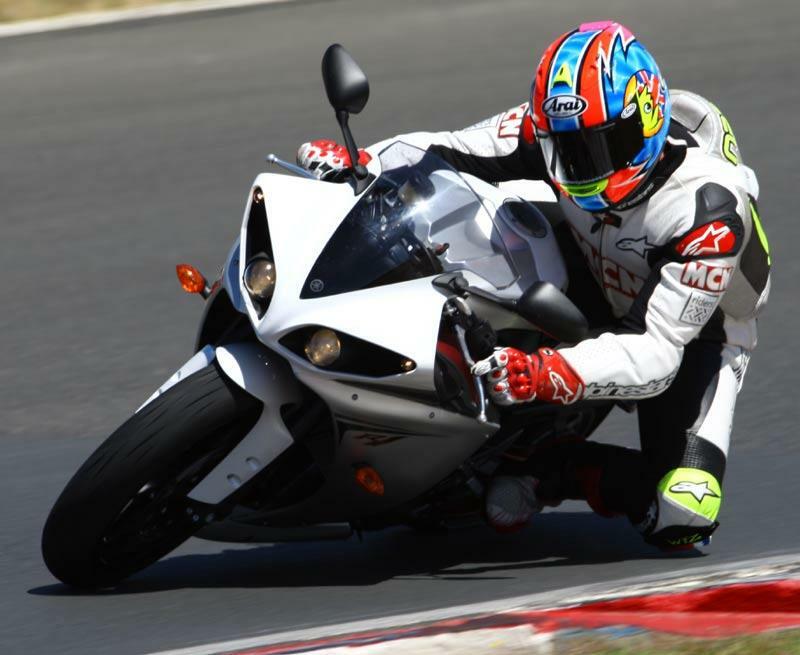 It’s now stronger and weaker in all the right areas, like more flex in steering head area for better front end feel and more rigidity in swingarm pivot for control. The engine is mounted 9° steeper and 8.2mm further forward than before, putting more weight on the front end. Weight distribution is now 52.4%, 47.6% front to rear. The riding position is more compact (bars are 10mm closer to rider, the seat 7.6mm further forward and pegs 10mm forward). The wheelbase is down 5mm to 1415mm. An R6-type magnesium subframe, shorter titanium end cans and a shorter, lower fuel tank improve mass-centralisation. Footrests are now two-way adjustable, 155mm up and 3mm back. The 43mm upside down forks now have independent damping, compression in left, rebound in right leg. Yamaha says this improves the damping response. As the forks are connected by the yokes and wheel spindle it’s all one unit, so is still balanced out properly. 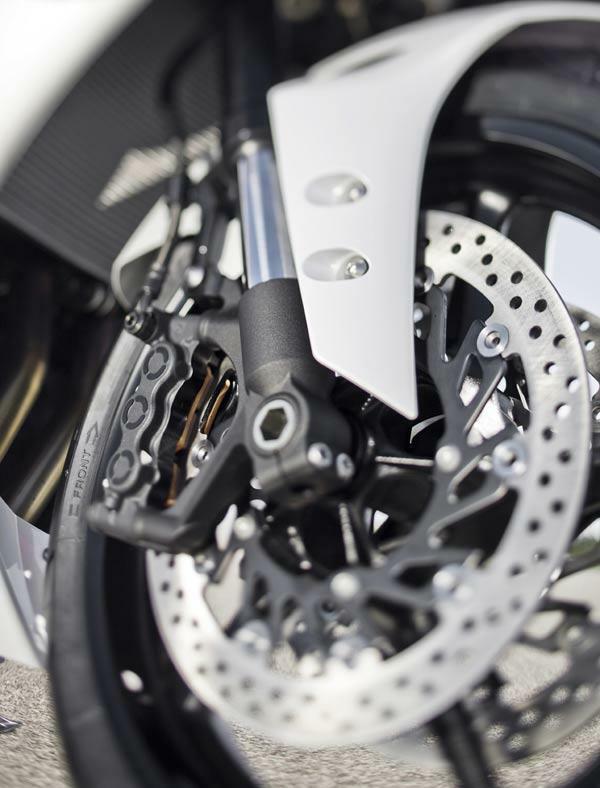 The ’09 Yamaha R1 carries the same six-piston caliper (but on different design carriers) and 310mm disc set-up as the previous model Discs are slightly lighter than before. 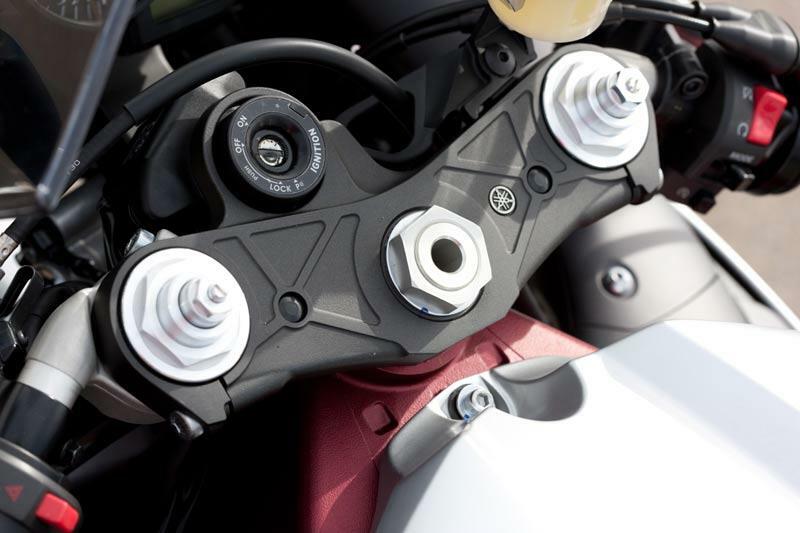 The master cylinder lever ratio is improved and lightened by 25g and the lever shape itself is new. The rear tyre profile is up from 50 to 55-section for better side grip. 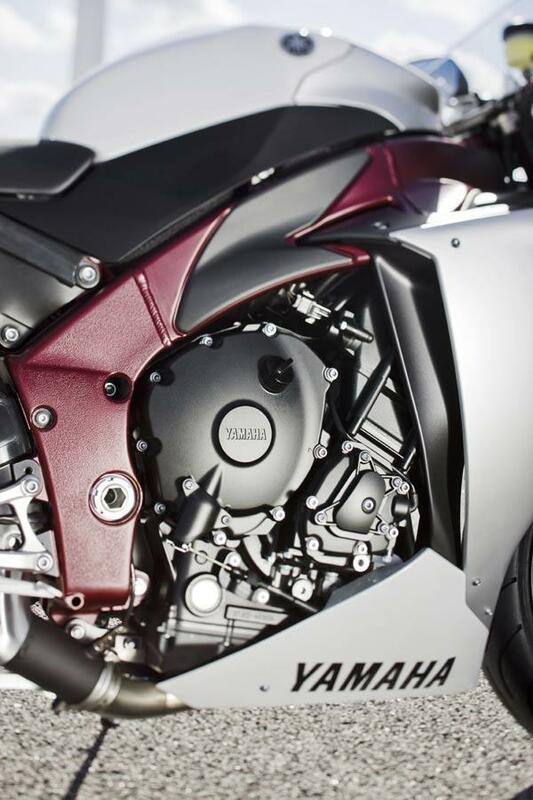 In addition to its new cross plane crankshaft, (all other in-line-fours have a 180° flat plane crank) the Yamaha R1’s engine now has the shortest stroke of any 1000 as well as the previous R1: 2007/8 R1: 77 x 53.6mm, 2009 R1: 78 x 52.2mm. That would normally make for a peaky power delivery, but new crank and firing order fill in the low and mid-range grunt. Peak power remains the same as before, but torque is up by 2ftlb. Peak power is now 179bhp@12,500rpm, while torque is 85ftlb@10,000rpm. The most noticeable difference compared to previous R1s is how quickly it accelerates out of corners. As before, the motor has forged aluminium pistons, fracture-split conrods, ceramic composite plated cylinders, titanium inlet valves and exhaust and a slipper clutch. The piggy back generator has been moved down to the end of crank to make room for the new, lower fuel tank. 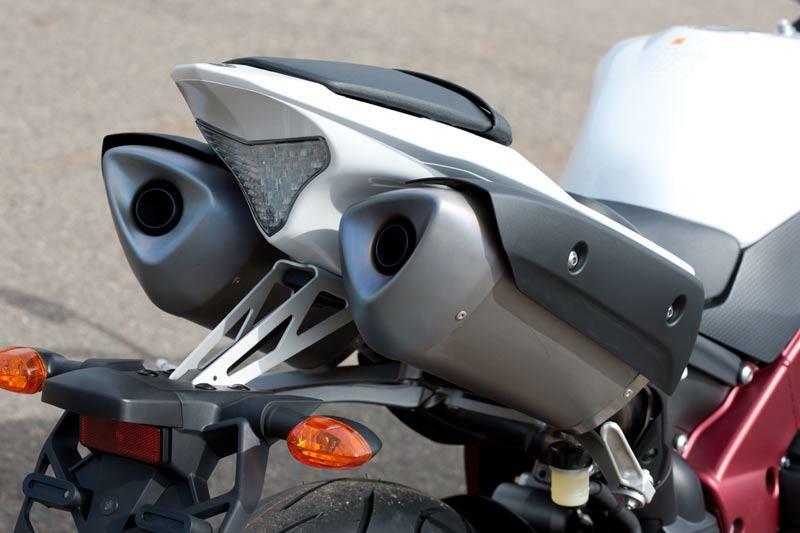 The fuel injection system, featuring electronically controlled variable length inlet trumpets, now has shower injectors in upper airbox like the Yamaha R6. The fly-by-wire throttle system is modified to give better control of air intake volume. Mounted on the right switchgear, the new D-mode system lets you chose, via the fly-by-wire throttle, three levels of throttle response: A, B and standard. The engine makes the same power in each mode (unlike the GSX-R’s which cuts power in its power modes). On A mode, the throttles open 30% faster between quarter and half throttle and 30% slower for B mode. 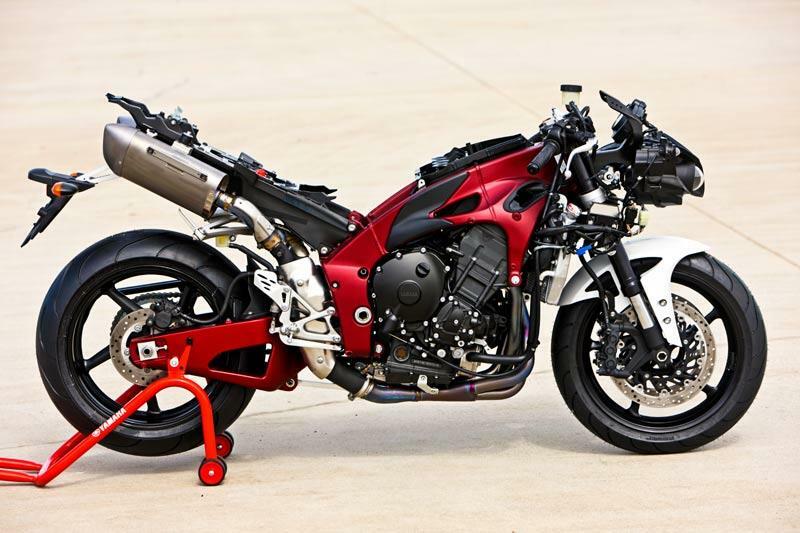 Yamaha R1s tend to be bomb-proof, even when raced and there’s no reason to suspect this one will be any different; in fact, the crank design helps the engine to spin more smoothly at high rpm. Build quality is right up there with the best. 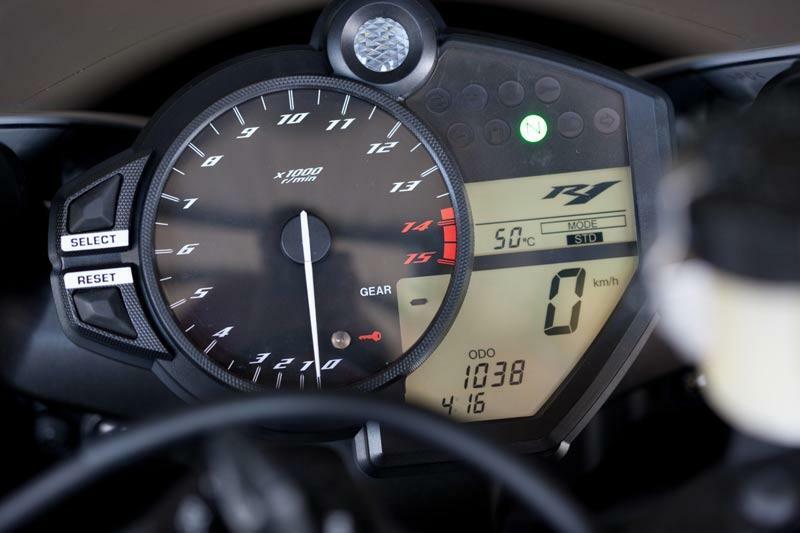 For the first time in its history the Yamaha R1 touches the ten-grand mark. It’s a lot of cash, but when you think that the original was £9199 in 1998, we’ve actually had it very good for a very long time. 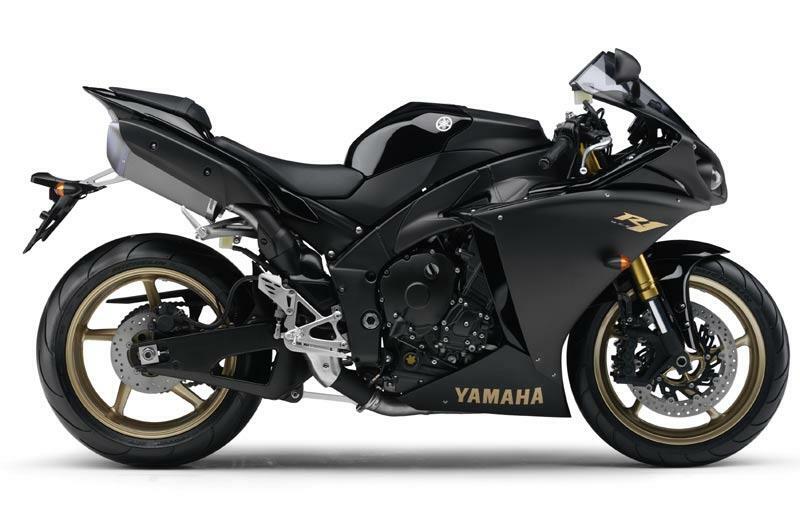 Also, when you think how close the Yamaha R1 is now to a MotoGP machine, you’ll realise it’s a lot of bike for the money. 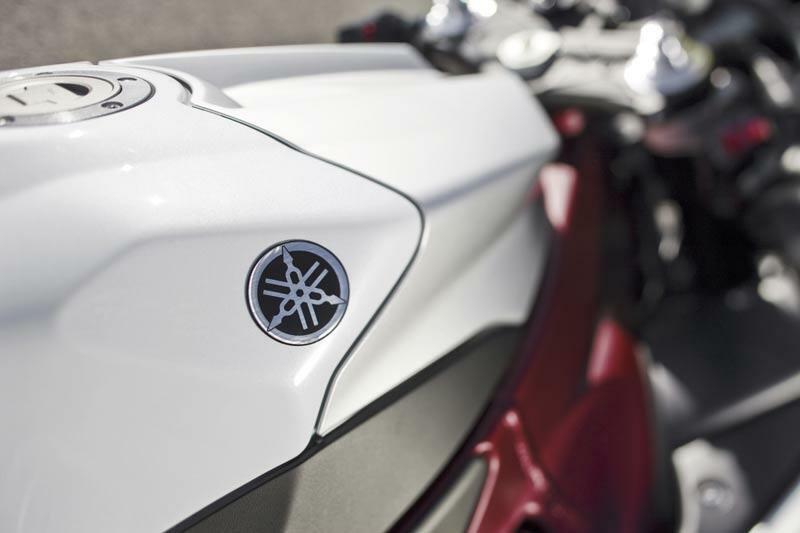 Find your next Yamaha R1 at MCN Bikes for Sale. 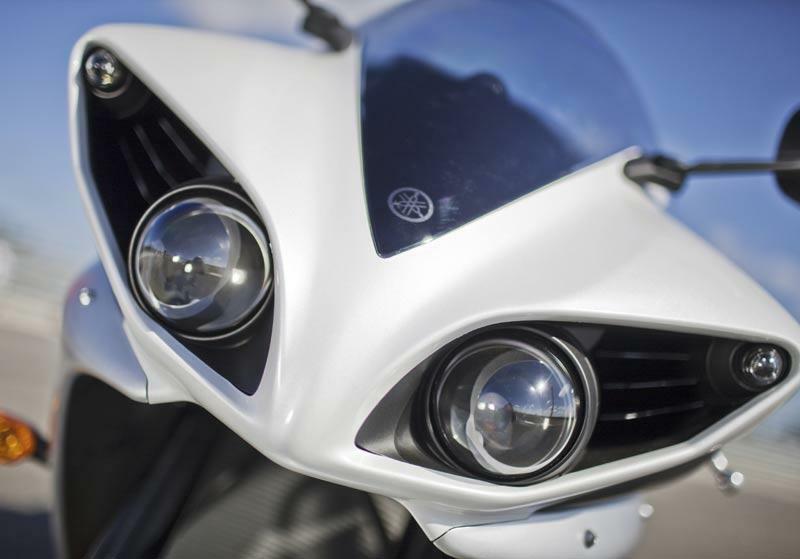 The Yamaha R1 has it all: projector headlights with electronically-controlled internal reflectors to change them from high to low beam, ride-by-wire throttles, variable-length inlet trumpets, fully adjustable suspension, slipper clutch, six-piston brake calipers, variable power maps, lots of titanium parts (like exhaust and inlet valves), adjustable footpegs, the list goes on. 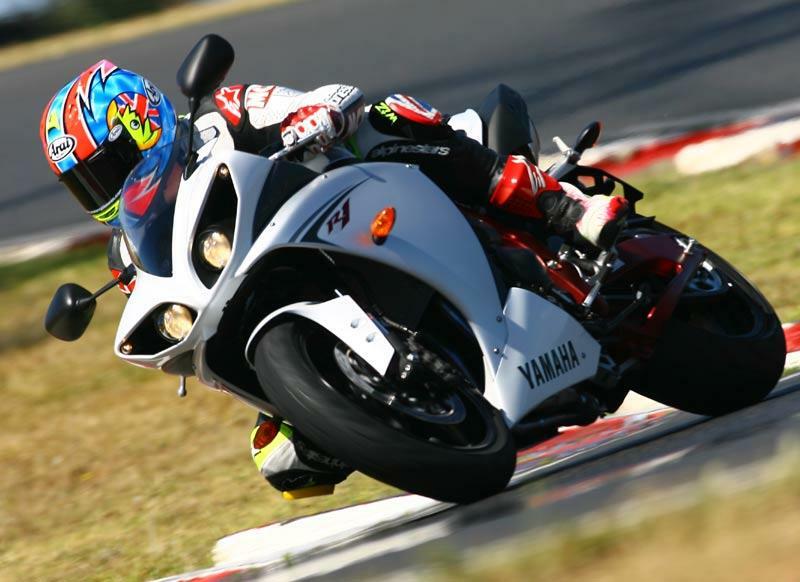 29 owners have reviewed their YAMAHA R1 (2009-2011) and rated it in a number of areas. Read what they have to say and what they like and dislike about the bike below. Heavy and lumpy, what a shame. Heavy. And sooo much weight on the front end. Horrible around town. Just not nice unless you are revving it hard. Not that fast. But sounds good! Not enough to keep up. Beautiful engine sound from the cross plane crank plus a characteristic and exciting ride make this an amazing bike in my eyes. Every ride is a lot of fun and meeting others who recognize the bike and fellow MotoGP fans adds to the experience. It's the first street bike I have owned so I don't claim to know a lot but it has been a great bike to own. It feels like it wants to be unleashed and for a full superbike size, position, overall ride suspension and power. It's actually pretty comfortable and easy to live with day to day. Passengers seem content with the ride but not exactly thrilled, until we start moving. When you want to use that power and handling potential, it's all there and inspires a lot of confidence, if you know the bike and how to use what you have. It goes really fast... I'm sure it's not the fastest motorcycle in the world but it feels like it. Through the entire RPM range, it pulls hard but in racing terms, it will shine and need to be kept above 7 or 8 thousand RPM's to get a strong acceleration. The only problem I've had is a dead battery and even though it was part of a headlight recall, that's been easily fixed at the dealership. I have had no major problems with it. Currently at 5,400 miles. It runs a little hot in slow, desert traffic too. The 200 includes two oil changes and not tires or any other parts. I know for a fact each fairing is roughly $800 from the factory. I don't even want to think how expensive any mechanical parts are. Luckily I have had no problems. Not much experience with aftermarket parts or tire choices. I may stiffen up the suspension but I may not. At least I have the option and that's about it, besides the throttle response modes. I don't even have traction control, which will probably make me seem like a dinosaur in a few years. Basically if you know how to ride and always have a jacket and helmet, the bike will respond and work for you. Purchased from a dealer and the dealer has been great and helpful the entire time. Advertised price was around $14,500 if I remember correctly and I got it for closer to $12,000. I love my R1, but I have had reliability issues due to the engine running hot in traffic. I live in Johannesburg which is 4500 ft above sea level - apparently the air is to thin to cool the engine properly. I have 20 000 miles on the clock and have had to replace the inlet valves. Not cheap!! I love the feel and sound of the motor - there is nothing quite like it! As stated, I had to replace inlet valves at 20 000 miles. The perfect combination of bike. Few bikes are game-changing material in their class these days. 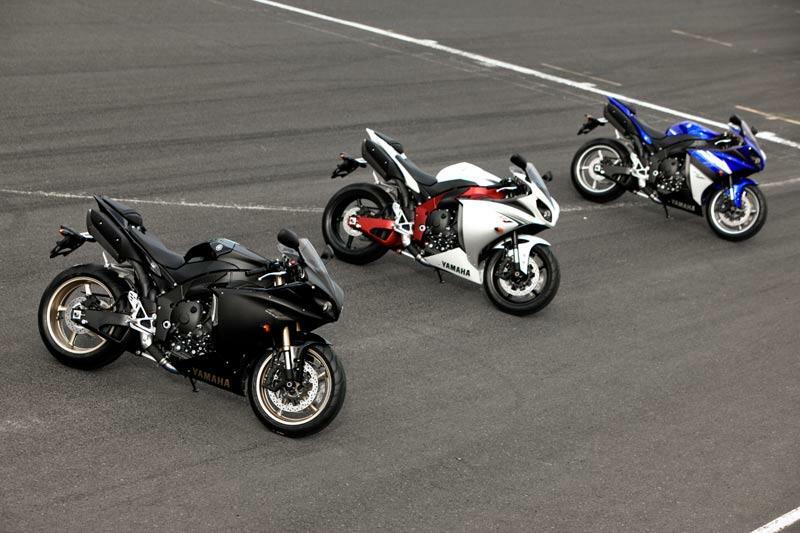 The Yamaha R1 is one of them. If it was possible for a 6/5 this is where the '09 R1 earns its keep. I do a fair bit of 2-up riding, taking the wife to weekends away (even honeymoon) - I know what a nice bike feels with someone on the back. I wanted to cover this one first because its surprising how well the front takes the extra load, but the R1 is set more prone to the front rather than a 50/50 balance which compensates well. The brakes are linear and massively full of grip, feedback and composure (with the excellent suspension), the back (although some don't like this) is powerful enough for powerslides on the entry to your favorite round-a-bout. The solo ride is also a revelation, the motor-chassis-combination is a technical exercise in right-first-time. I was expecting the old "widow-maker" to be an ever-watching presence, but loe, a knee-down test ride told me that with the new firing order of the engine, you really will need to ham-fist the throttle, at lean, in the wrong gear, to really get in danger. 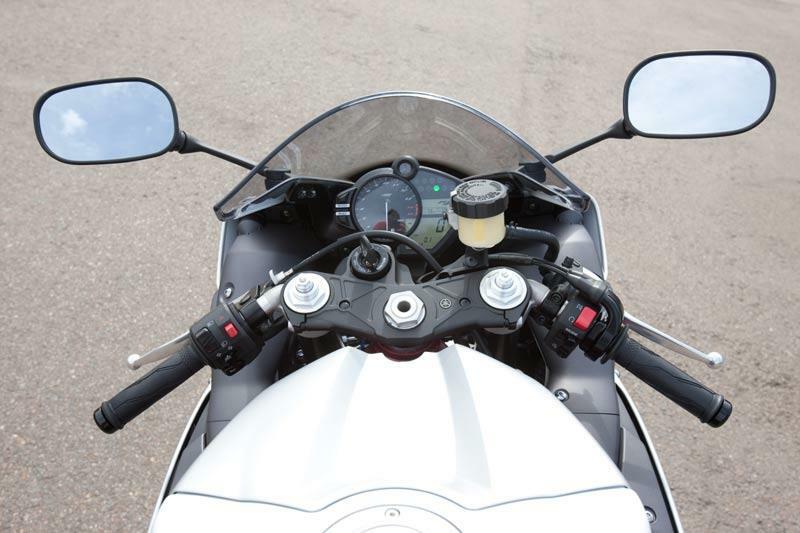 The ride is composed and calculating, which may take some getting used to the pliancy of the bike, but once mastered, you have as much a do-all bike as you like that can do Euro-touring and trackdays, too. The cross-plane crank motor is simply the best engine I've ever had the pleasure of red-lining at Cadwell Park. What a lump. The firing order flattens out the power delivery to make that 178BHP usable but not in a way that get the track marshals picking you out an air-fence. Its steady, the gearing is perfect for both slow and fast riding, track or road. An hilarious combination of fun and practicality I have seldom found in other inline 1000's. 95% of the bike is build to an impeccable standard, plastics, paintwork, badges, finish. The overall build is exceptional - especially if you're coming from a "budget roadster" like an SV650, ER6, etc. I've had no mechanical issues at all with this machine. Not as easy to work on as my SV650 but not far off, I've serviced worse - I do all my work with the exception of engine/ valve timing. Which makes servicing relatively cheap overall and makes you feel quite good. The service intervals are OK, but they could have been longer in my opinion. 18k on the clock and nothing is wrong with it. The stock parts on this bike are brilliant, the front suspension with its separated damping on L & R along with a rear shock thats a breeze to change is great. The dash is replete with the best of the ages must-have bits, gear indicator is a massive bonus. The power maps are few yes, but makes me wonder why you'd want more than the 3 in fairness. 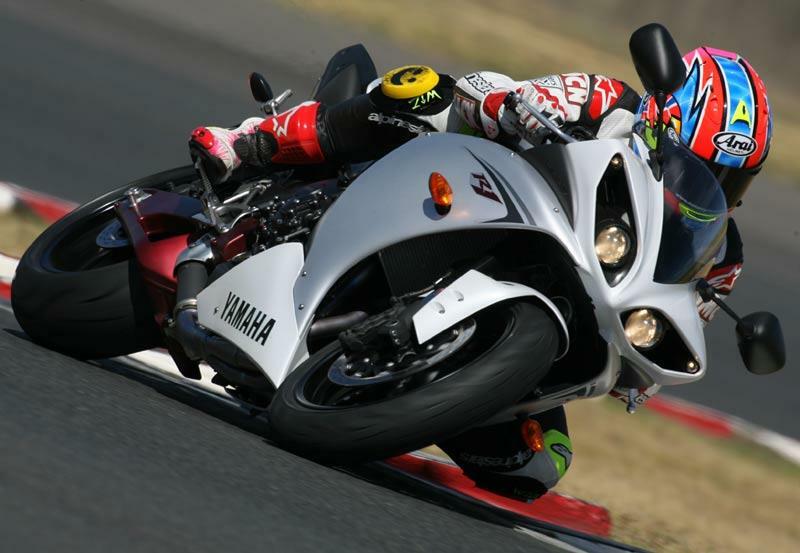 The only downside with the equipment is pillion provision is de regular superbike spec. A Renntec grabrail sorts out that (along with the lines, some feel). However - do not try and adjust the pillion pegs. Just. Dont. 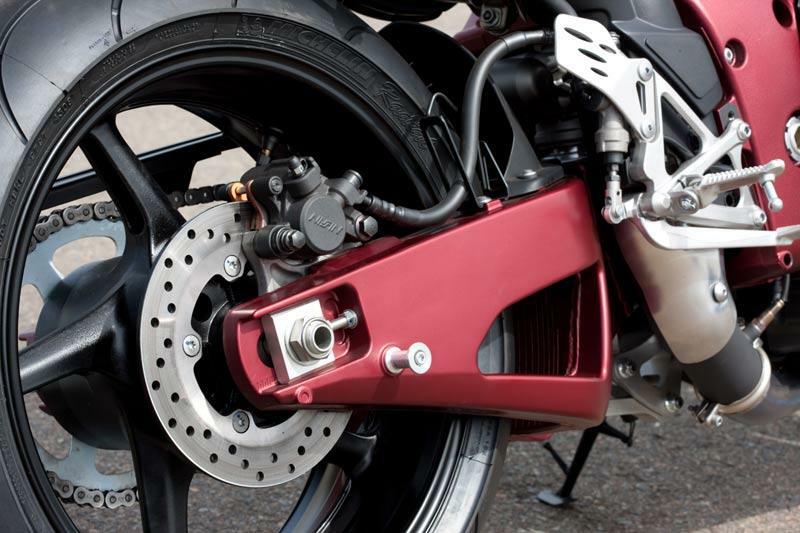 The rear subframe is a magnesium item which looks great and is strong but a pain to work around. There adjustable pegs for the rider as well, although I have always found R1's to fit me from the showroom. Rode it for "25 miles" came back 2 hours later and bought it there and then. I'd been looking for a new bike for about a year at this point. 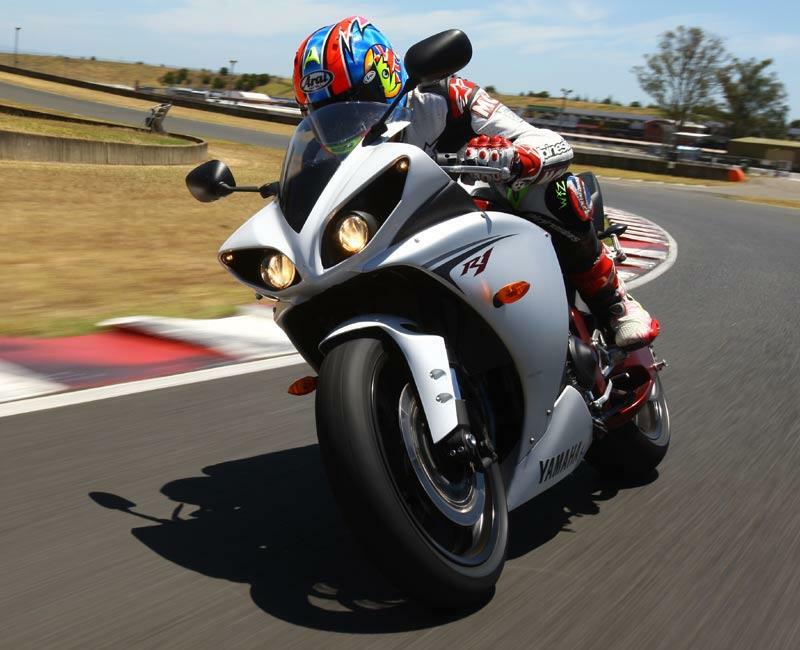 Faster than a Panigale 1299 in every situation except the track. Even before we put the BSB spec motor in it. Am still playing around with the ECU to try to get rid of the jerk when going from closed throttle. Gearbox broke at 9000 miles so I upgraded the motor at the same time as fixing the box. Tyres, oil, chains etc. Same as any superbike. Engine work cost £4000 this year though! It's got wheels and stuff as standard and not much else. Bought privately from a nice bloke. I've owned my white R1 for a little over a year now and covered 3000 miles on it. 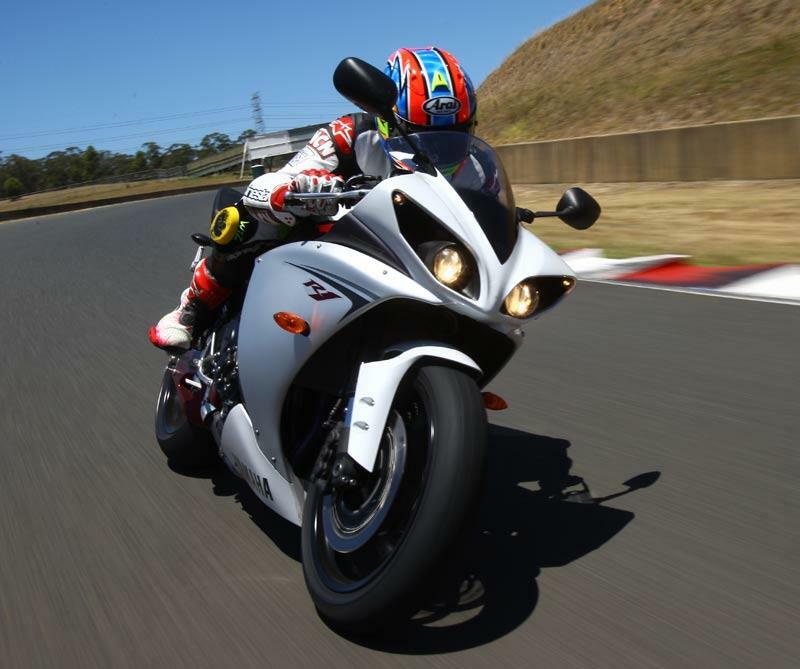 I owned the 2002 R1 previously and noticed massive improvements accross the board except for one.. Handling! Now.. before you all rip into me, I know the suspension on this bike is cutting edge on this bike so I am not slating it but compared to the one I had before it's terrible. I think the main reason for this is that the previous owner played with the suspension settings on the front forks because I noticed on a couple of track days that the bike is reluctant to turn in and seems to improve if I drag the back brake slightly as I turn in?? during the corner.. it feels unstable and doesn't fill me with confidence. I checked tyre pressures which were fine and have now fitted new Pilot Power 3's but still the strange handling occurs?? I've also checked for free play in the front and rear wheel bearings but this was also fine. Any ideas about what might be causing this would be appreciated! I know that once this handling issue is sorted.. from my point of view the bike will be perfect! I love the power, looks, sound, build quality, riding position and just about anything else you can think of.. I just need someone to help me find that cherry for the top of an almost perfect motorcycle cake. Thanks! 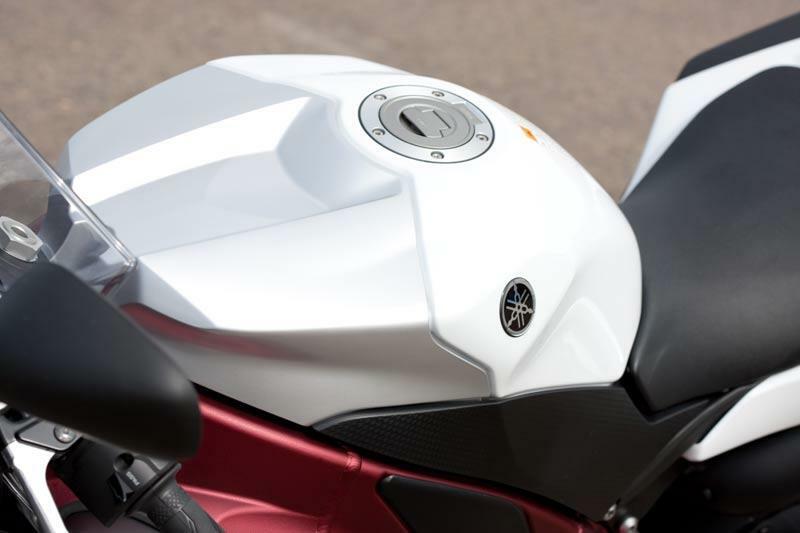 BIG Bang R1's HAS TPS problems too, even though Yam UK say no to any TPS problems. Got my 2009 TPS replaced last wk along with the APS since they cant tell which is faulty. Parts cost £300, My R1 would have to run 50mile b4 prob kicked in. Throttle became erratic only revving over 5k. DANGEROUS stuff!!! TPS problems running way over 50% of bikes sold after I decided to call a few main dealers in UK. BUT NO RECALLS like Yam did b4 with previous TPS faults on their machines. Disgusted at this especially how dangerous the bike becomes almost forcing you into riding out of control, and the What if question has to be asked if a crash occurred, if fatal no doubt be put down to rider error since prob disappears. My 5th Yam 1000 and this the best so far, love it, but TPS fault is naughty by YAM UK not addressing this problem like b4. Okay, so I am new to sport bikes. I have road many dirt bikes throughout the years. 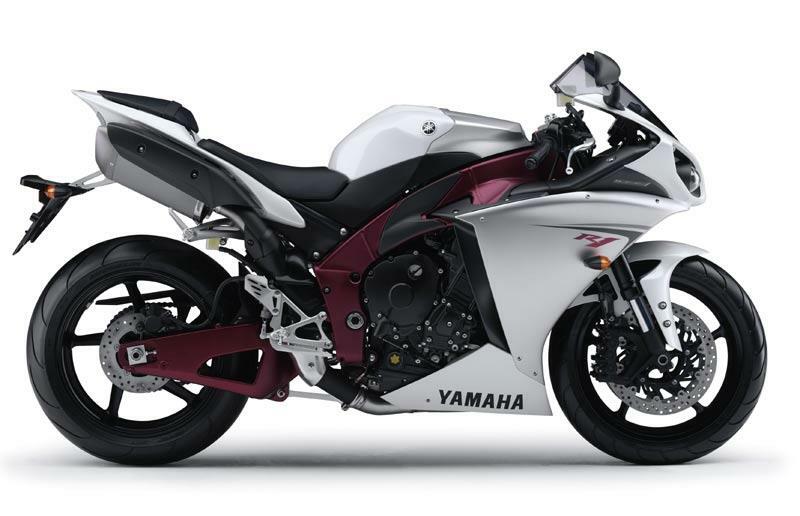 I received a large sum of money, I found a dealer who had a 2011 YZF-R1 brand-new. I bought it cash outright last week. Well I have already put 800 miles on the bike. It was very easy to learn and the power delivery is great. The adjustable power setting allowed me to adjust into the power very easily. Simple fact is people do not even try to mess with this bike, the look is backed by performance! Yes, I could have gone for a more traditional bike, but I felt that this was the way to go. The new cross plane shaft provides nice even power delivery. 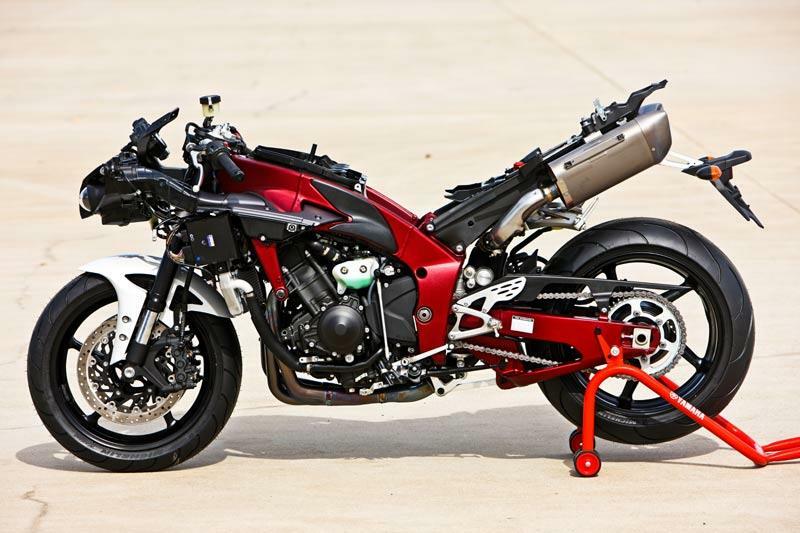 Even other sport bike riders rethink taking this bike on. I bought my 2010 R1 3 Months ago with 800 mils on the clock - I'ts now racked up 3500 including an all weather trip around europe. This bike is perfect for me, its bigger than most of the other bikes in its class (Being 6ft 2 thats pretty important!) This is purely my own opinions - The engine produces so much more mid range grunt than your normal inline 4, however you still have that full kick top end. It handles superbly also, it feels totally planted and inspires confidence. 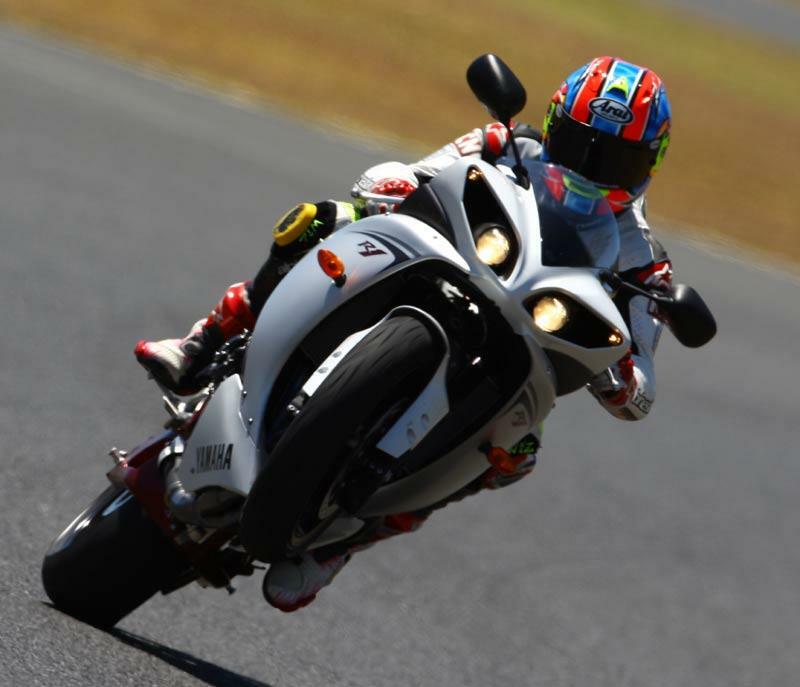 Having ridden the ZX10r and CBR1000rr also I preffered the R1, The ZX10r was just a schizofrenic hell hound (Great fun but reduced my life expectancy significantly!). 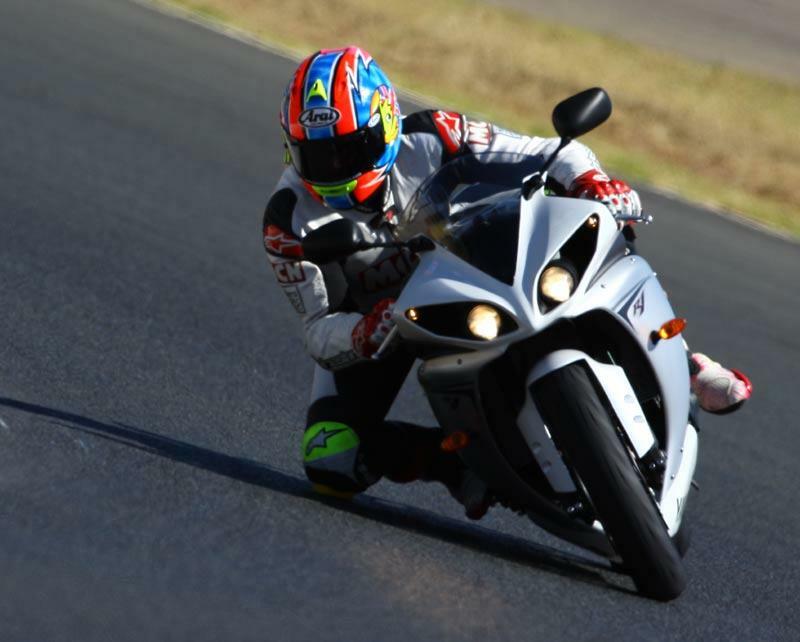 The CBR1000rr was super smooth, and arguably, better handling, however once you have ridden the R1 I seriously missed that low down and midrange power so for that reason its my winner. 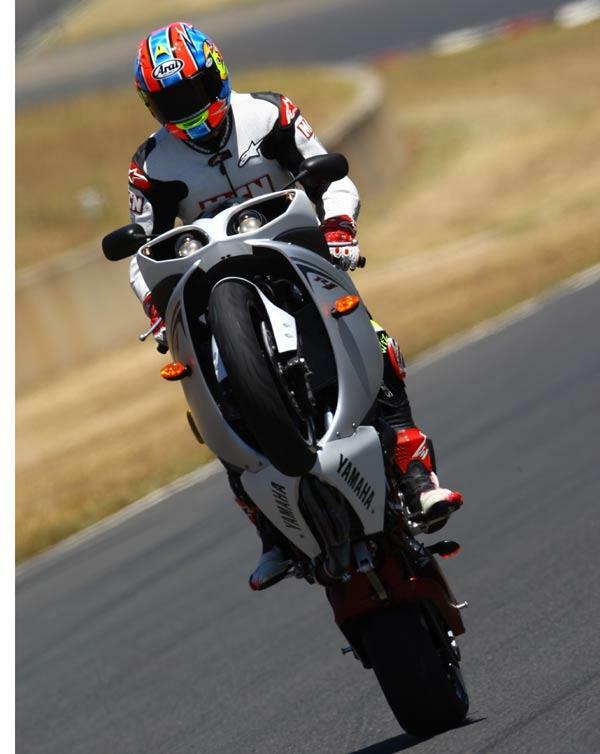 Started life with 04' R1 then 07' Now 10' unbelievable leaps and bounds by this maker. I think the 10' is 10 out of 10.... Pro - Tourque awse leaving traffic behind at lights - Ride and handling brilliant new positioning of rider. - Gauge up grade always forget which gear when (trying) to take it easy - Sweeter, louder noise... metal coffin drivers hear you (no cutting you off) - Throttle response..... simply WOW Cons - They put crap michellin tyres on from the factory... 07' came out with Bridgey's burn em asap... - Heat issues again... solution, get carbon fibre cannons...you will be pleasantly surprised. - Chews the juice... Only got 200k's full tank Would recommend this machine any day..... Cheers. My dream bike. Hopefully i'll win Rossi's TT R1! Traded my 2008 Ducati 1098 for the new 2009 R1.I had alot of reservations about it before the descion was made,mostly due to the fact I thought I had the bike I would own for the rest of my life,and previously being lucky enough to have owned nearly all the latest and greatest bikes over the last 10years,I thought I'd found the bike of my dreams that ment more to me than just having the lastest tool.But a few problems with the Duke mainly the constant cutting-out,and also the fact that I do around 7-10k a year on bikes ment that I started to look else where.Anyway,after choosing the new r1,(and telling the wife the payments are roughly the same) I got one and made sure I put on the akras with Y piece straight away .Having had it for a little while now I can honestly say it's by far the best bike I've ever owned.The engine is a perfect mix of a twin and 4c,the handling is beyond the 1098 and my old K7-1000.It came with those fucked-up dunlops on it,but when I get some money together I'm putting a pair of 2ct's on that should quicken-up the steering.The brakes felt a bit vague at first but no doubt that's just the bedding-in.Not much engine braking,or maybe it's because I 'm used to the Duke.Comfort is good for me(6',13st) and the noise...fantastic! can't wait to do a trackday hopefully in march as the weather is shite at the moment.The looks are growing on me now after the exhaust,footrests,plate holder,and all the indicators have been changed to flush mounts.It is a very different bike to ride at first,but once your used to it,it's hard to imagine another bike offering such a unique blend of tech-and engine character.I'm off out to the garage t have another look! Getting cold, but I don't care. This bike eats flys...especially the big green ones haha! This bike is fantastic, the engine is so smooth and just sounds great.The riding position is also great but it gets hot for your legs if stuck in traffic.Might need a rad guard too.I did 700 miles in two days and could still walk when i got off, so the riding position isn't bad. It's a bit stiff out the box and will need some tweaking to sort it. 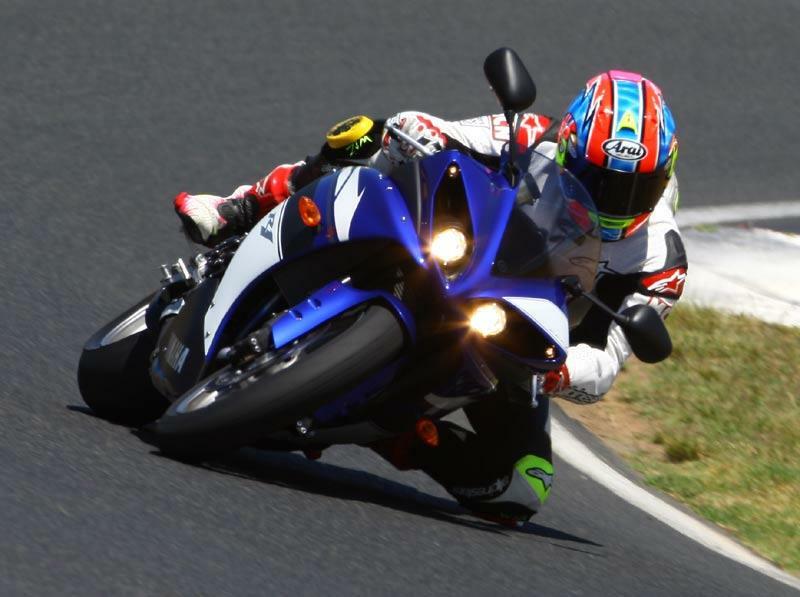 Tyres are a let down, yamaha should have put something else onto the flagship bike. At ten grand plus it's not cheap but worth the outlay in my opinion. Love it, especially in black. You know what... I really hate people who say the R1 is UGLY. I love the look of it! I have become BIKESEXUAL!!! I brought an R6 two months ago and got a full acrapovic system on it, but two days ago when I went to my local dealer. I saw the R1. I didn't like the look of it, but I brought it knowing it'll be faster then anything I can imagine. I've done just over 100 miles so far and it's not runned in yet but it's still fast. I love the 3 stage remaps (I haven't used A Mode yet which gives you the full 182ps) comparing to my R6 which was 140ps Anyways after ridding it, It looks much more beautiful now. It's grown on me. LOVE IT! Had my R1 now for a little under a month and love it! Took it to the 2009TT to run it in and serviced by Road and Track who supplied Rossi's R1 for his lap of the circuit while he was over there. This bike is awesome!! And the difference it makes switching from the Standard setting to 'A' blows your mind and transforms the bike into a race bred missile. I still have memories of laughing under my crash hat at just how fast this bike accelerated and was in it's element riding around mountain section of the circuit. The amount of torque it produces coming out of corners made it feel like a twin, but then once you're tucked behind the screen and blipping through the gears it's back to the four banger missile it's always been with an extra kick. Since being back from the Isle of Mann I've fitted some Yoshimira Tri-Oval cans to it which makes the R1 sound like a caged animal. The only gripe I have which isn't a huge one is that it's not brilliant for a pillion and that Renntec still haven't made a grab rail for it? So if anyone has a 2009 R1 and live around Bournemouth, then would you loan Renntec your bike for the week as they need one to design the new rail. I would, but I'm over 400 miles away?? Over-all, this is the bike to have and wipes the floor with ALL other bikes at the moment! Well fellas, my mate picked his up at the weekend, and i can say honestly...its superb, flick it to "A" mode and let rip, its like nothing i've ever ridden and i've ridden triple and owned an SP2 so have had a good experience of many different motors. It takes a while to get used to it, many may not like it when first on board, but like with any change, you need to give it time and get used to it.The noise is spot on, but again if all you've ever ridden is IL4's you may get off it and think "it sounds and feels a bit lumpy/rough" cant wait to see if the other manufacturers are brave enough to do summat different..now then, where's my cheque book!! Picked up my new R1 09 model on Friday. What an awesome bike and still running in at the moment, cant wait to get the 1000 miles done so i can really see what a beast the bike is. This is my 3rd R1 and definitely the best. The way it pulls from anywhere in the revs in any gear is unbelievable.